Everybody loves watching a good action movie on the big screen. Everybody, except the two people sitting directly on either side of me, the unfortunate person in front of me whose chair gets pummeled every time a loud explosion occurs, and maybe anyone within shriek-audible range of me–which is basically everyone in the theater. I am not a dainty shrieker. I spent all of Star Trek: Into Darkness and Iron Man 3 doing weird spastic knee tucks in my seat and giving the front seat an extra-hard kick when its occupant turned around to glare at me. That being said, I love watching action films in theater. 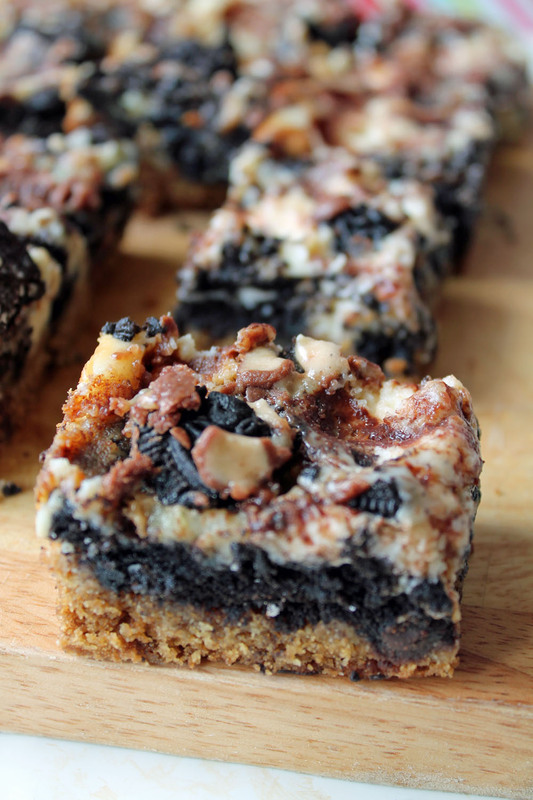 If I have one weakness, though (aside from these “slutty cheesecake bars”–yes, we’ll get to these smexy bad boys and their seductive name in just a second), it’s an action film with plenty of eye candy. Speaking of which, have you seen Chris Pine in the new Star Trek movie? Never mind the fact that my Trekkie knowledge was limited to Spock’s horrendous haircut up until the first new movie in 2009. The hysterical prepubescent middle-school fan girl in me rares up every time young Captain Kirk flashes those sultry baby blues my way. As an added perk, he’s sweet-looking and smart. He graduated from UC Berkeley with a Bachelor’s in English in 2002. Oh heyyy. Guess who else has an English degree from the big Blue and Gold? Shall we discuss our shared literary interests over a cup of Free Trade tea and vegan pulled pork, Chris? Yes? Yes? Or maybe over a panful of these? I was so excited when I first stumbled across these at Baker’s Royale. She is known for inventing some insane bar cookies, with zany names to boot (like Man Whore bars, which I still need to try–um, yes, please?) These are no exception. No, sireeee. Bake up a soft, chewy layer of perfect chocolate chip cookies (even from a package if you’re in a hurry–I used one of my favorite chewy CCC recipes). 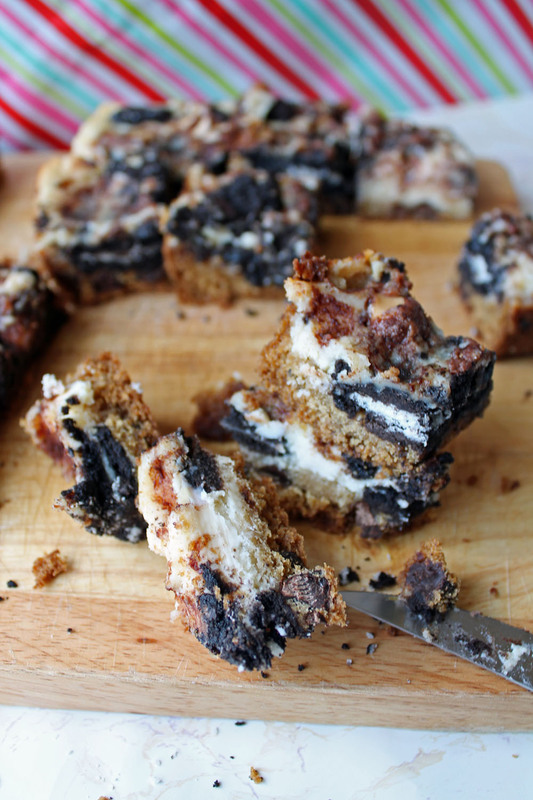 Layer up your Oreos–16 whole, creamy chocolatey ones, then smother them in a smooth and rich cheesecake filling. Chop up some more Oreos and Whoppers and sprinkle them over the whole shebang. Bam. Slutty bar cookies for slutty perfectly innocuous, intelligent motives to meet Chris Pine. My coworkers and students thought I was insane when I brought a plate of these into the office last week. These reports can be neither confirmed nor denied. However, when I stepped back in half an hour later, these were completely gone. Completely. These crazy-loaded treats (the only kinds I accept) make great conversation starters, apology/appeasement gifts, after-school sweet tooth snacks, and enticers of potential love interests. I doubt even Chris Pine could resist them–but I’ll let you know after I test this theory out. Print this recipe and beam them up, Scotty! For chocolate chip cookie base (original recipe from My Baking Addiction)–one of the chewiest, most satisfying CCC’s you’ll ever make! In a large mixing bowl, cream together softened butter and both sugars until fluffy. Beat in vanilla and egg. Mix in flour, baking soda, and salt until just incorporated. Gently fold in chocolate chips. Set bowl aside and make cheesecake layer. If you’d like to make these as individual cookies: Preheat oven to 350 degrees F. Drop prepared cookie dough by rounded tablespoonfuls on a lightly greased cookie sheet. Bake for 11-13 minutes, until lightly golden. Remove from oven and allow to cool on hot cookie sheet for at least 3-5 minutes before removing to wire rack. Cream together softened cream cheese and sugar until light and fluffy. Add egg and vanilla; beat in until completely smooth, but be sure not to overbeat. 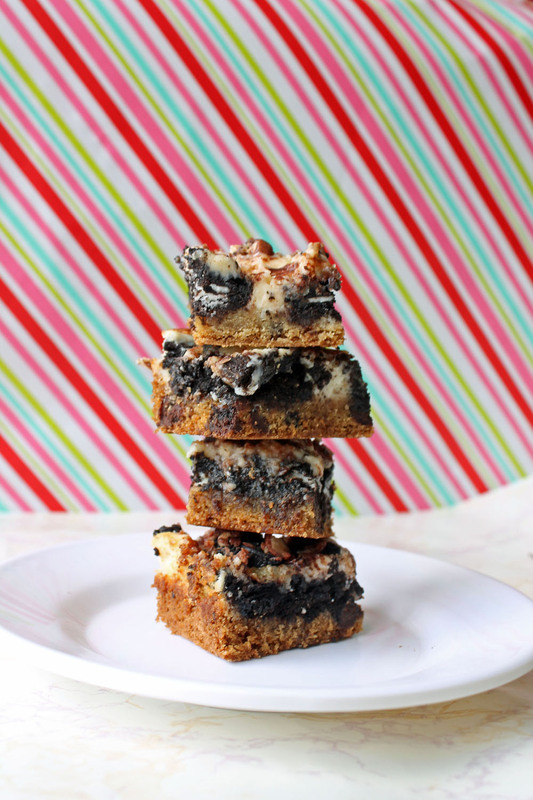 Set aside cheesecake layer as you assemble the slutty cheesecake bars. Preheat oven to 350 degrees F. Grease an 8×8-inch baking pan. Spread cookie dough evenly across the bottom of the prepared baking pan (or drop them by rounded tablespoonfuls on a cookie sheet if making cookies). Your cookie dough layer should be about half an inch thick–if you have leftover dough, you can bake it immediately as individual cookies or simply toss it into the fridge for baking at a later time. Bake for approximately 10-12 minutes, until the dough is just cooked through and firm. Remove from oven. Layer 16 whole Oreos on baked cookie crust. Pour cheesecake filling evenly over Oreos. Sprinkle 5 chopped Oreos and 5 oz. chopped Whoppers over the cheesecake. Bake in preheated oven for 35-40 minutes, until cheesecake is pretty well set. Remove from oven and allow to cool completely in pan before cutting. Best served chilled from refrigerator (but make sure you store it in the fridge either way). Note: If you eat these warm straight out of the pan–as I did–you might be alarmed to find that the Whoppers are almost impossibly chewy! Don’t worry; if you wait like you’re (ahem) supposed to, they will regain their crunchy texture after chilling in the fridge. I think you should send Chris Pine a box of these awesome treats and see what happens 🙂 They look delicious!!! I totally would, except I have a feeling traveling cheesecake wouldn’t go so well–it’d make things so much simpler if he just joined me for coffee 😀 oh well. Thanks a bundle for stopping by, Lisa–it’s great to meet you! Stopping by your blog now. These are, like, the most fantastic things everrrrr! Absolutely–and addicting to boot!! Thanks, Dorothy! 1 panful = maybe 3 lunches? If they last that long? 😀 Thanks, Sally! How can you not love this recipe? They’re certainly a must make, although they will be dangerous! I busted out my stretchy pants in anticipation–hope you get a chance to try these dangerously delicious treats! 😀 thanks for stopping by–it’s great to see you. Rayna! These look absolutely amazing! 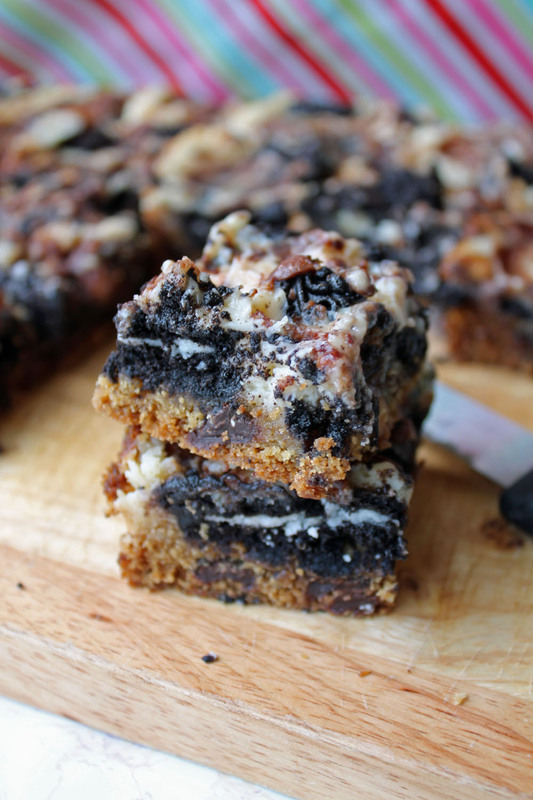 My hubby is a HUGE Oreos fan so he would love these bars! Pinned and thank you so much for sharing at Mom On Timeout! Glad to have been able to join in! Your husband will LOVE these–maybe even more than I did (and that’s saying a lot) 😉 thanks for stopping by, Trish! Fun post! We watch tons of movies, but haven’t been to an actual movie theater in years – Netflix is just too easy. Anyway, great looking (and slutty!) cheesecake bars. 😉 Thanks for these. If I had a Netflix account, I’d say the same! Although there’s something to be said for action movies on a big screen. Glad you like ’em, John! OH MY! I am drooling on my keyboard!